Largehearted Boy: Book Notes - Joshua Mehigan "Accepting the Disaster"
Book Notes - Joshua Mehigan "Accepting the Disaster"
Joshua Mehigan's Accepting the Disaster is a finely wrought and dark poetry collection, a modern classic that has earned the author numerous comparisons to Philip Larkin. 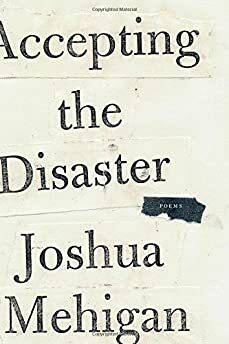 "Accepting the Disaster is the closest thing to a masterpiece a reader of contemporary poetry is likely to encounter." I got the idea for my poem "The Forecast" while visiting Iowa in 1998. It's likely that the poem will conjure Black Sabbath for no one but me, but I can't help thinking of them in connection with it. Arriving in Iowa from New York City, I was excited by the novelty of a rented car and, in the airport, bought a cassette tape of Master of Reality for personal soundtrack. I blasted it in the white Honda Civic I'd rented, feeling transformed, as I had in high school, from whatever I actually am into (what else?) a Master of Reality—virile, ugly, and awesome—till I began to understand that I'd somehow passed from highway to road, to dirt road, and then to the conclusion of the dirt road, which stopped dead in a dense cornfield. "Into the Void" was playing, until I turned it off. Lead Belly's version is my favorite. But the first one I got in my head was sung by Erland van Lidth de Jeude. Van Lidth de Juede was a massively large opera singer who played an ax murderer in the comedy Stir Crazy, which I watched 75 times on HBO when I was 11. I enjoyed the irony of a killer who could sing tenderly and sorrowfully. This is also the irony of the song itself, which is addressed by a condemned prisoner to his love outside. I have a poem called "Down in the Valley," about a terrible crime that takes place in a valley. My poem follows the victim and omits the killer and his beloved, but the song still seemed apt. My wife and I were near the end of a long night drive, once, when one of Janis Joplin's versions of "Summertime" came on. I hardly noticed the introductory guitar noodling. Before I could place the song, her voice was filling our eerily-lit car with the one word, "Summertime," and all the hair went up on my arms and I felt like a child waked up by an airhorn. My first attempt to write about this was really about my aesthetic experience and was therefore bad. So I started thinking about Janis Joplin. Two-thirds of the finished poem describes "Ball and Chain" at Monterey and could've been called that. But "Try" is a great song, and so I called my poem "Try." It is also an important sentiment. This song's title serves as an epigraph for my poem "Sad Stories." My wife suggested it to me after I showed her the poem, which directly addresses Michael Jackson at times and references his roll as the scarecrow in the movie The Wiz. The poem is about distorted self-image, especially the kind that leads people into eccentricity, plastic surgery addiction, careers as dictators, and so on. In 2010, I participated in an event organized by Roddy Lumsden, who asked numerous poets to write poems based on lines from the above-named song. Then, of course, we got together and read them in a bar. I was assigned "Don't follow leaders, watch the parking meters." I ended up producing a bad, short blank-verse poem about a schizophrenic man with paranoid delusions involving parking meters. After the event I put the poem away for a year but later reworked it and put it in my current book as "The Orange Bottle," a heavily-rhymed, 17-page poem with no parking meters in it. Roddy's Dylan assignment also helped generate George Green's fantastic poem "Bangladesh," from his collection Lord Byron's Foot. This song provided me with the title for a poem, "How Strange, How Sweet," which has to do with gentrification and nostalgia. The poem also incorporates the song's title. I didn't have a particular singer in my head when I wrote it, and I surely don't want my poor poem to compete with Ella Fitzgerald, but she recorded a live version with Oscar Peterson in 1957 that's perfect. My poem "Cold Turkey" got started with some lines from The Bacchae that worriedly ponder the advisability of dancing after some crazed devotees of Bacchus get carried away and behead someone. I quit drinking in 1999 and, apparently, with drinking, quit dancing, too. My poem won't make anyone think of The Stooges, but I can't remember dancing without thinking of intentionally-sleazy clubs like Coney Island High that, unlike most clubs, sometimes played music I listened to at home—"Real Cool Time" or "1970," by The Stooges, or "People Who Died," by the Jim Carroll Band. "Real Cool Time," especially the sordid guitar at the end, still fills me with the same happy sense of self-destructive oblivion. The current lack of interest in ballads means that when I publish short-lined poems in rhymed quatrains someone always mentions Auden. I love Auden, but I also love other ballads, from "Edward" in the fourteenth century to James Fenton's in the twenty-first. Musical ballads, especially in Appalachian folk music, have also had a lot of influence on me. Like a lot of them, "O Death" shares its conceit with a verse ballad or two—in this case, for example, "A Dialogue between Death and Youth" (pub. 1564) or "Death's Uncontrollable Summons" (pub. 1685). And there's another fantastic musical version, "Conversation with Death," by Dock Boggs. The Wallin version is a 1964 field recording made by Peter Gott and John Cohen in North Carolina. Berzilla Wallin was a mother of twelve and seventy years old when she recorded the song. Her performance wrings out whatever sugar might be let into the song by a more refined style. It's a little bit punishing. I often aspire to this state of affairs in my poems.